Jazz singer Sarah Vaughn (1924-1990) was honored with a stamp in the USPS Music Icons series that was issued yesterday. The ceremony was recorded live, and including a lot of great singing, if you're interested it is below. I thought the music was particularly good from around 25 minutes onwards. 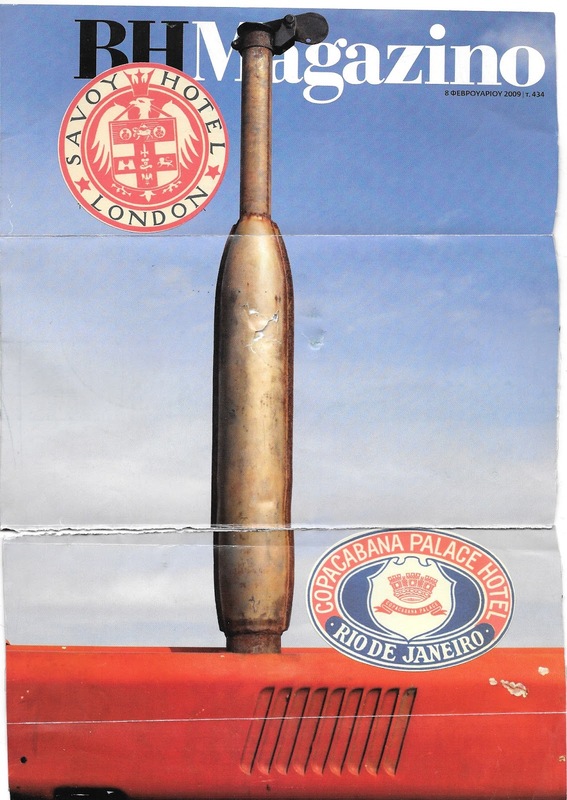 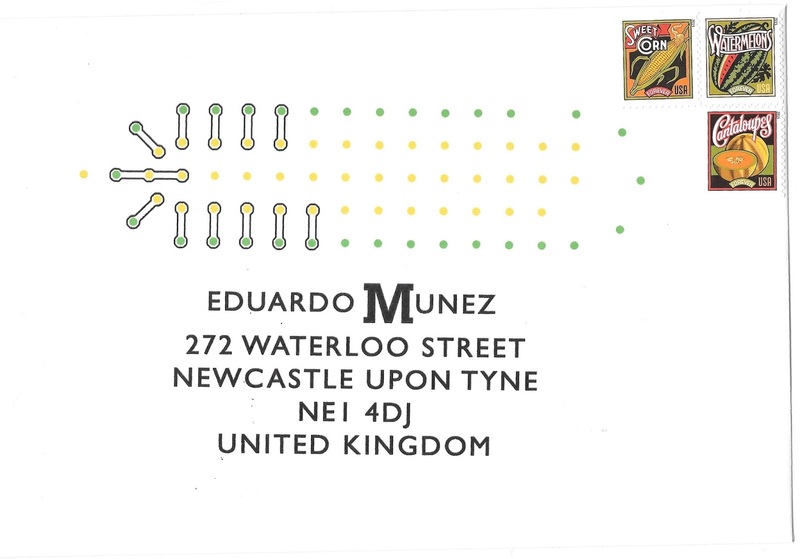 This is a more 'filled in' version of a previous mysterious Eduardo Munez envelope. And the same information in a spiral format. The first envelope is not corn, or a church, or an electrical circuit, or an air port terminal map. 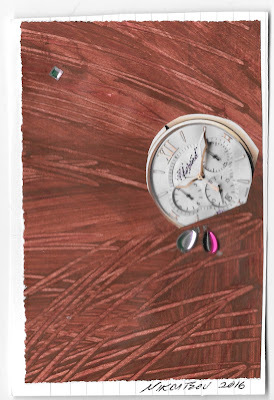 It's not a seating chart, a game, a pill, a button hole attachment or a martian cribbage board. 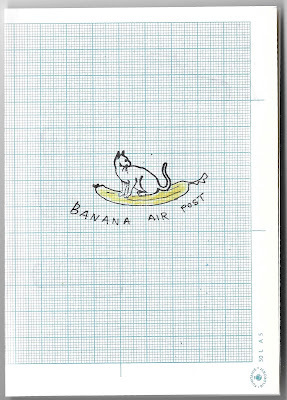 And it's not a football field, or a zipper. 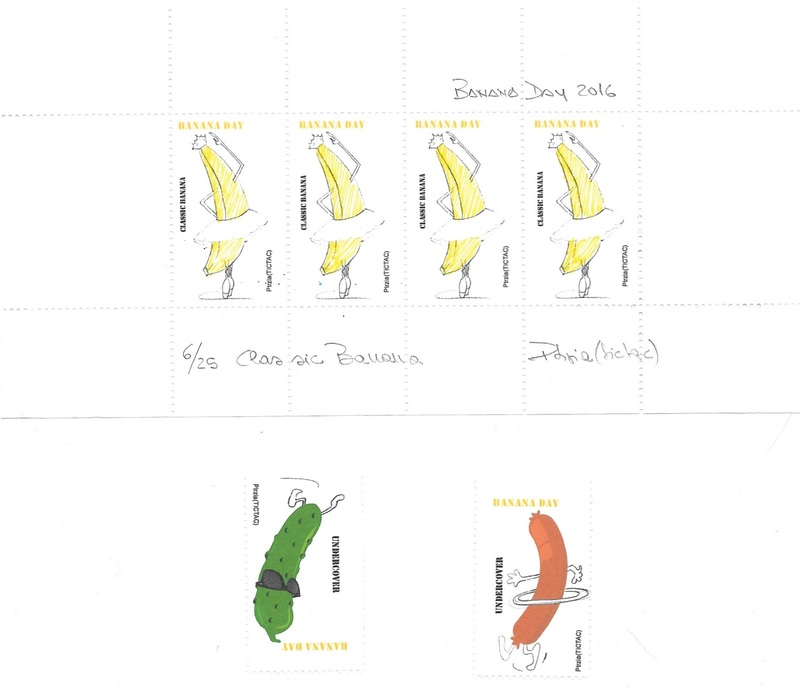 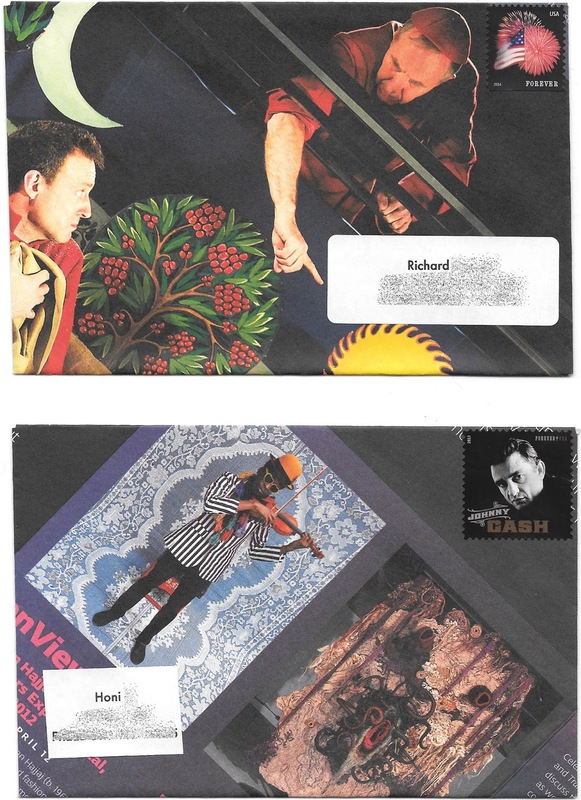 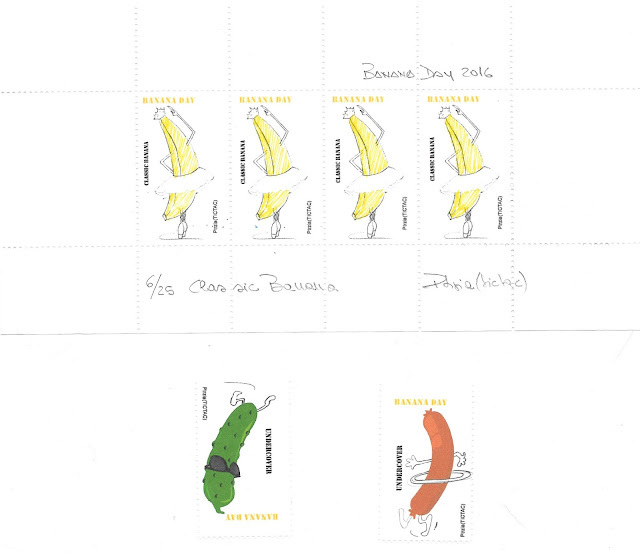 The stamps may have been a bit of a red herring, however I used them because the first image makes me think of corn. 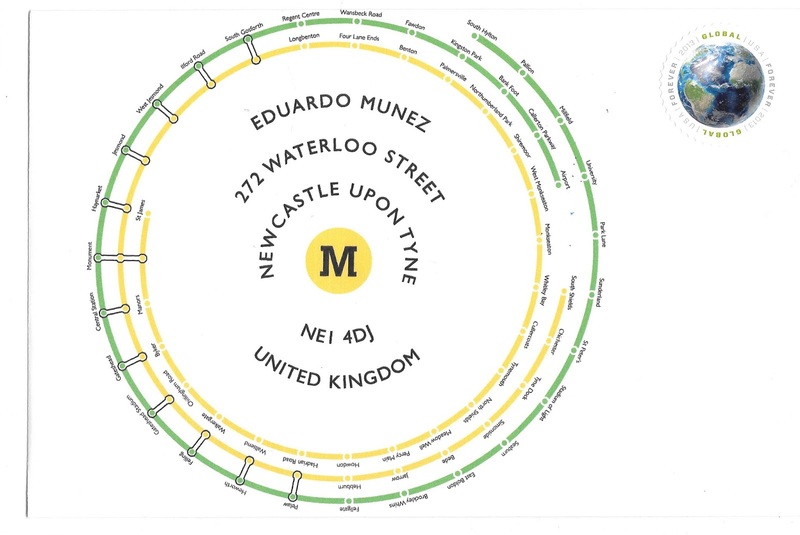 It's an abstracted map of the Newcastle metro system. 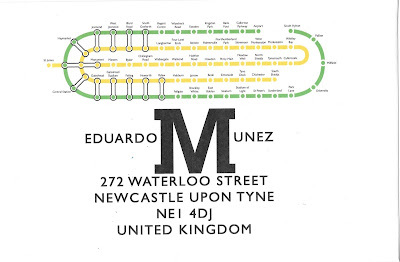 Here's the current official map. 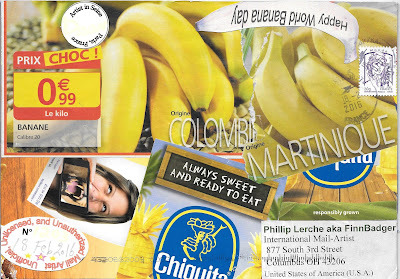 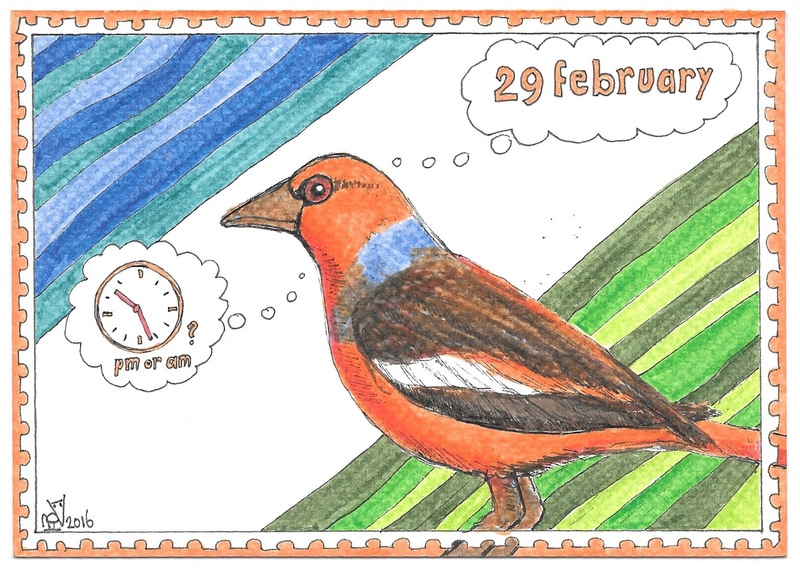 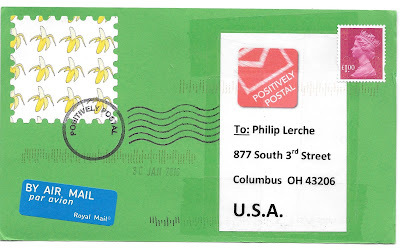 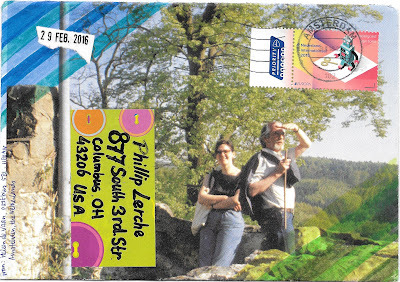 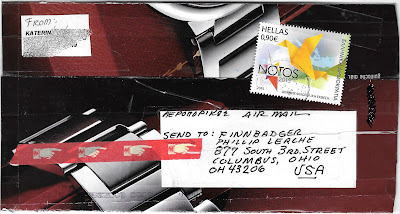 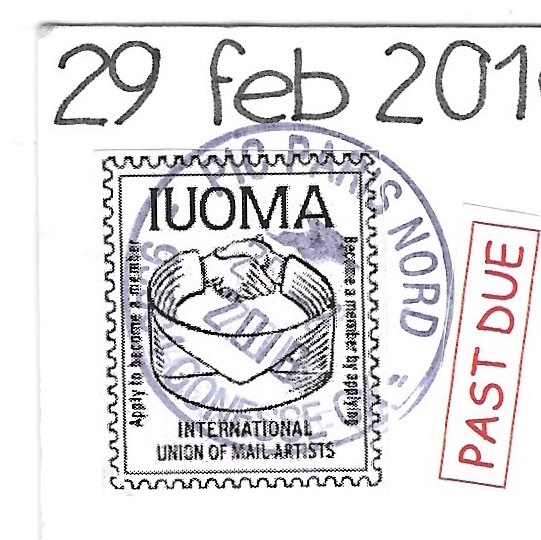 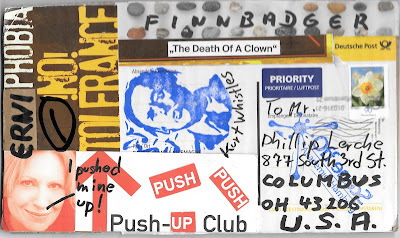 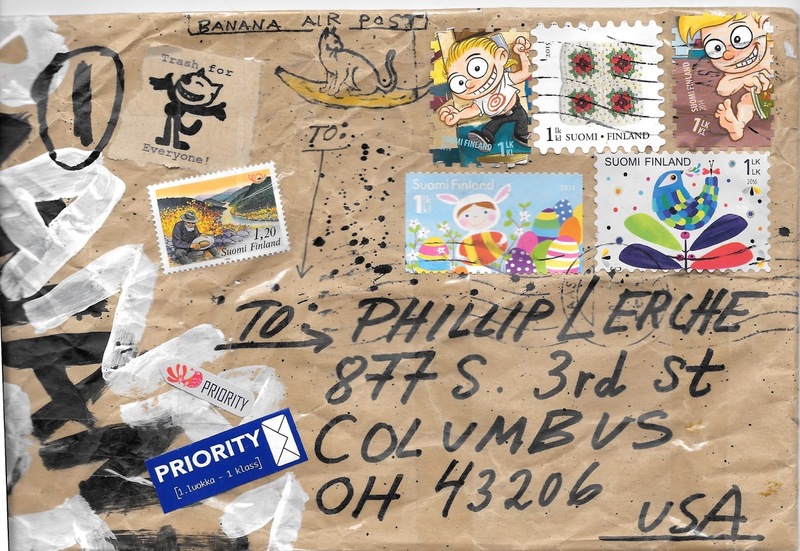 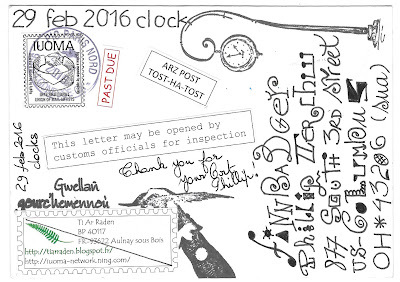 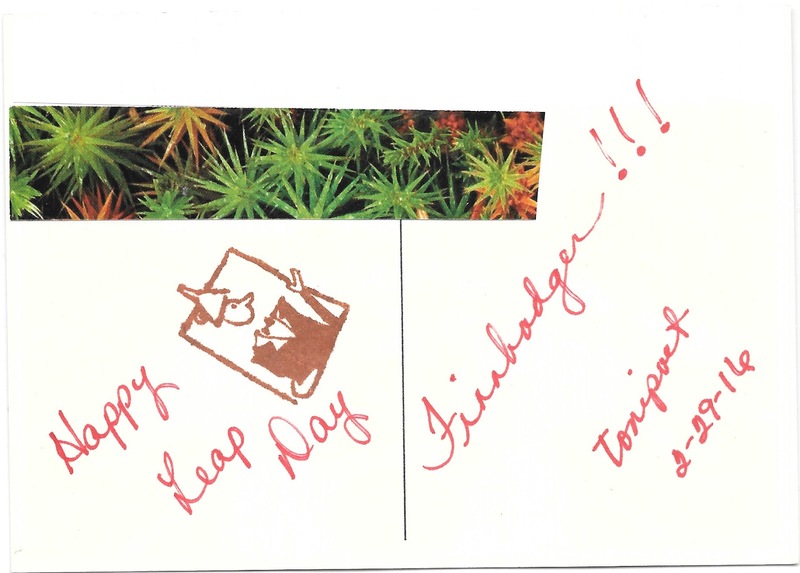 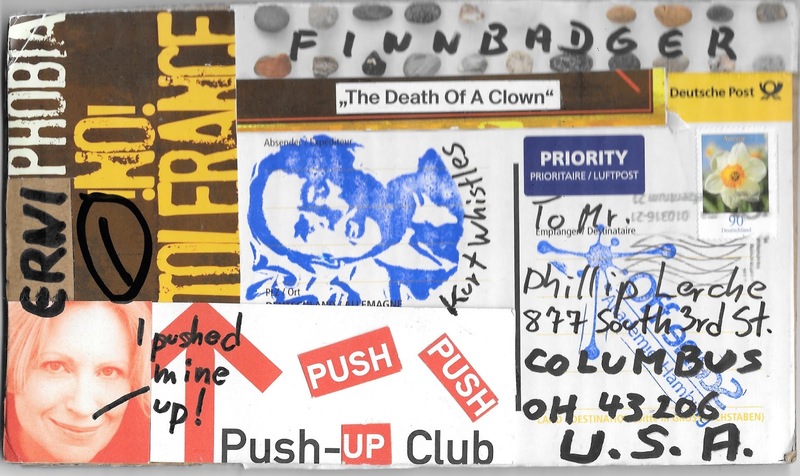 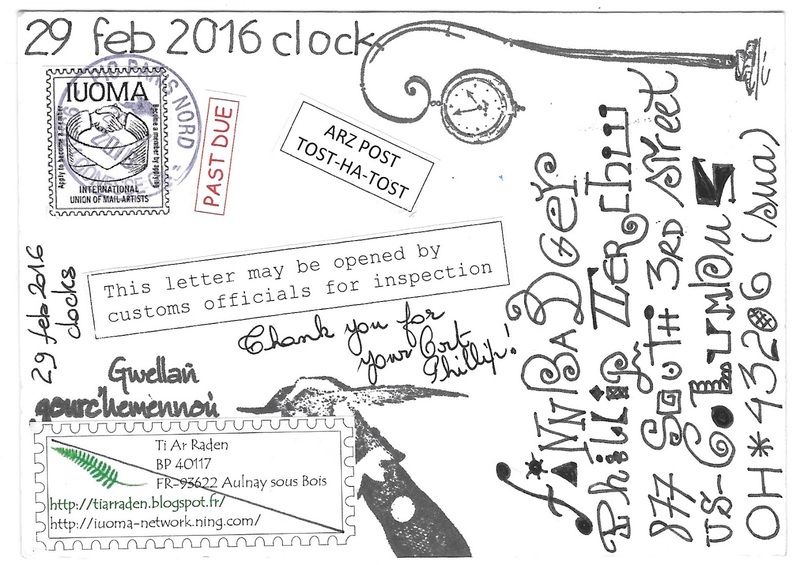 This is the mail art that was mailed specifically to get a 29 Feb postmark. It's been a month since leap day, so it's time to show off the big haul! 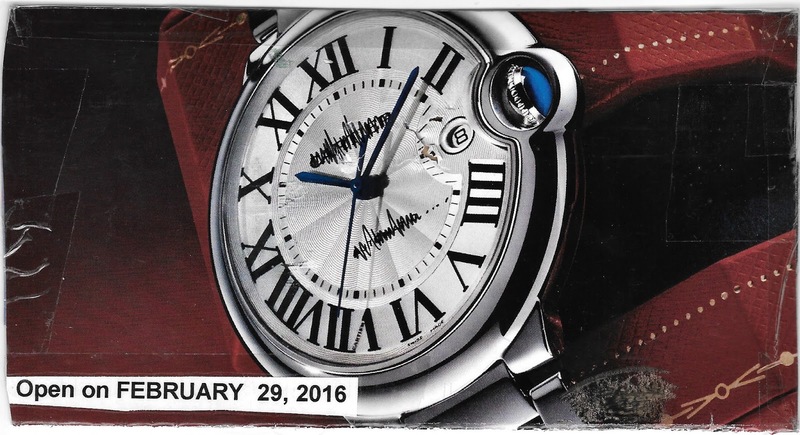 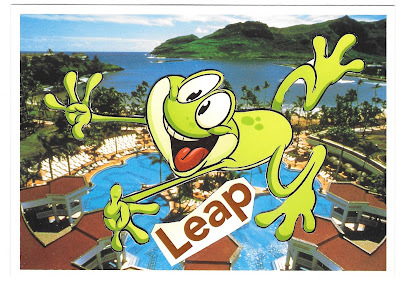 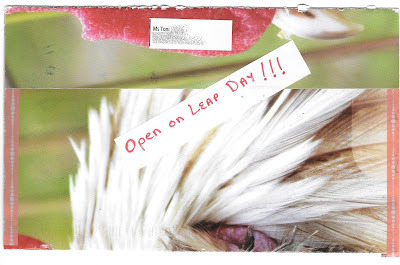 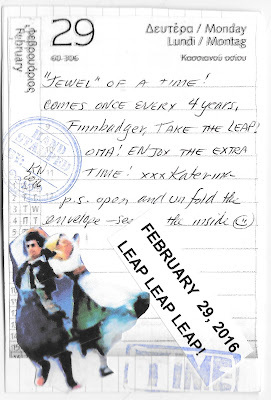 First is the mail received before leap day. This is the page Kat used for the envelope. 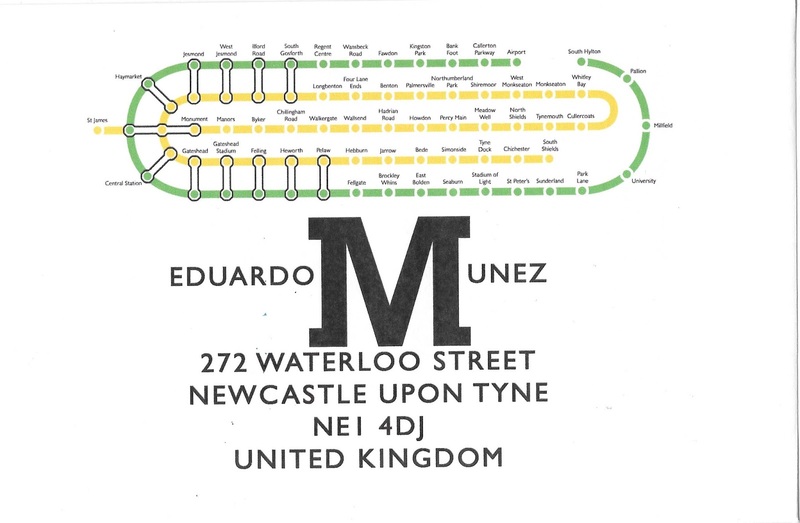 The Who is Eduardo Munez? 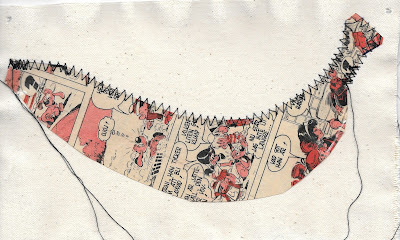 has already ended. 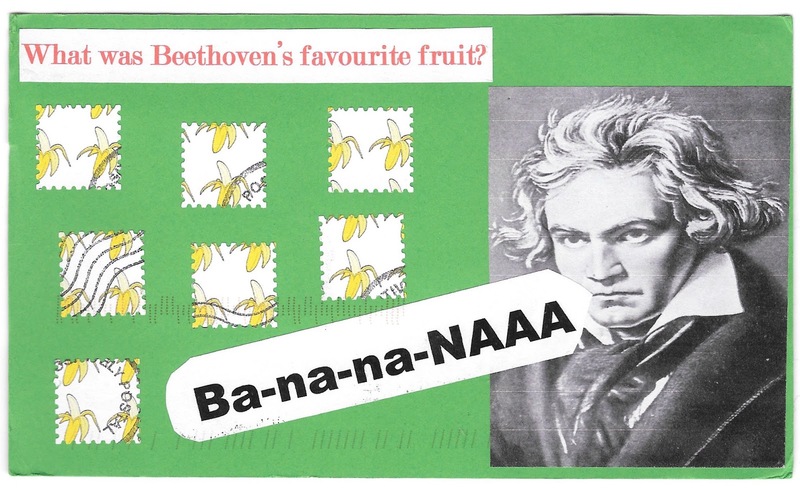 Here's one of the last I sent in. 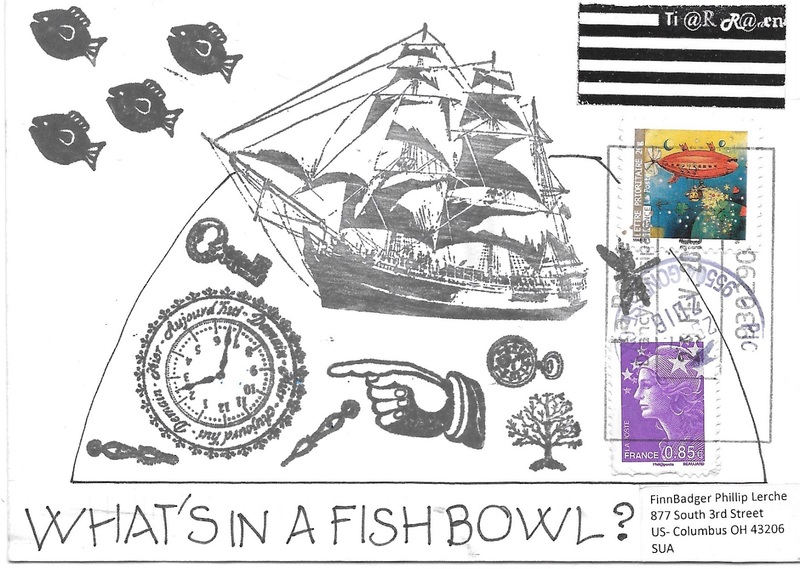 Any guesses (without cheating) what this is based on? 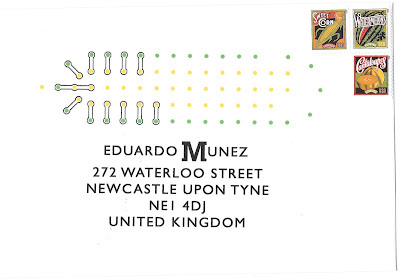 Envelope 797 off to the mysterious Mr Munez.The deadline has been extended to the end of April [passed, but] and you can see all the fab mail he received here. 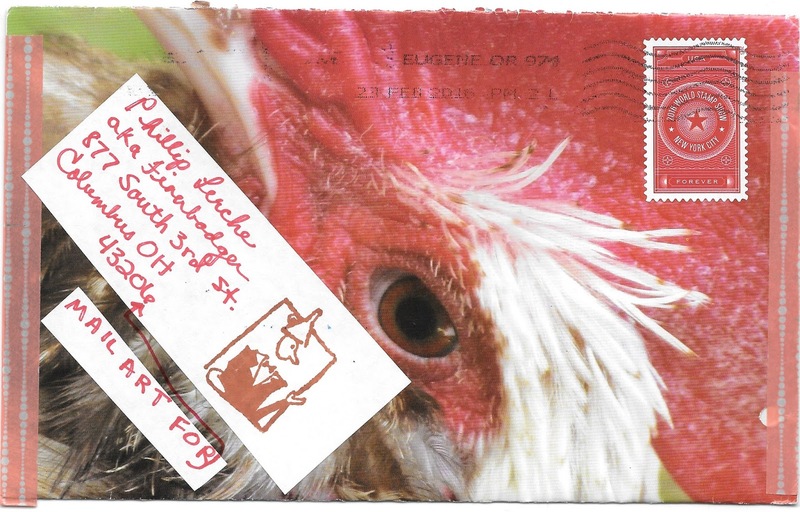 Bridget sent me a great envelope inside a plastic cover. 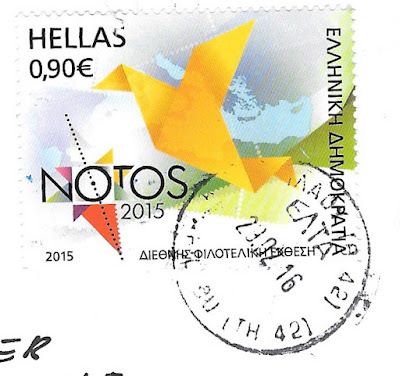 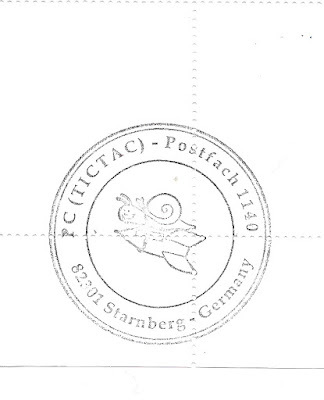 Sadly the stamp fell off in transit. 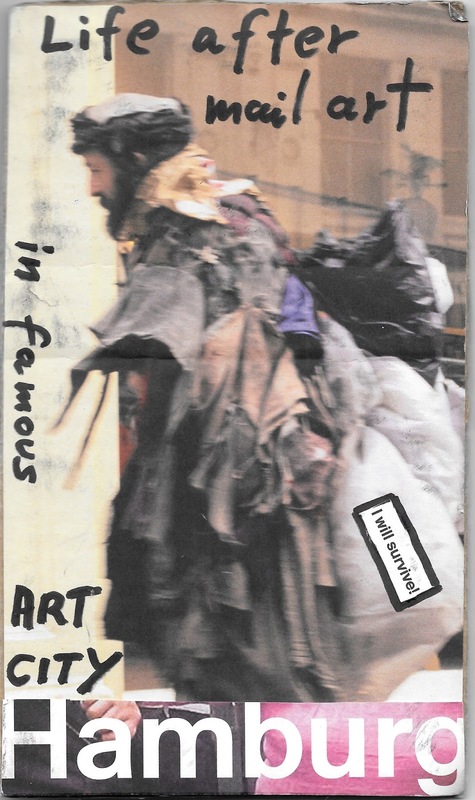 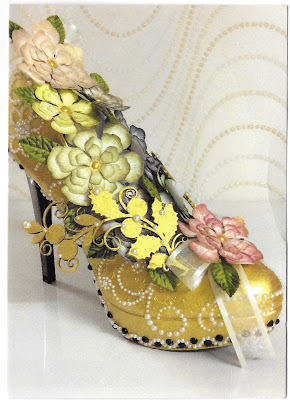 And inside, a postcard of a decorated shoe she entered in a competition. Another intriguing double-sided collage piece from Erni. 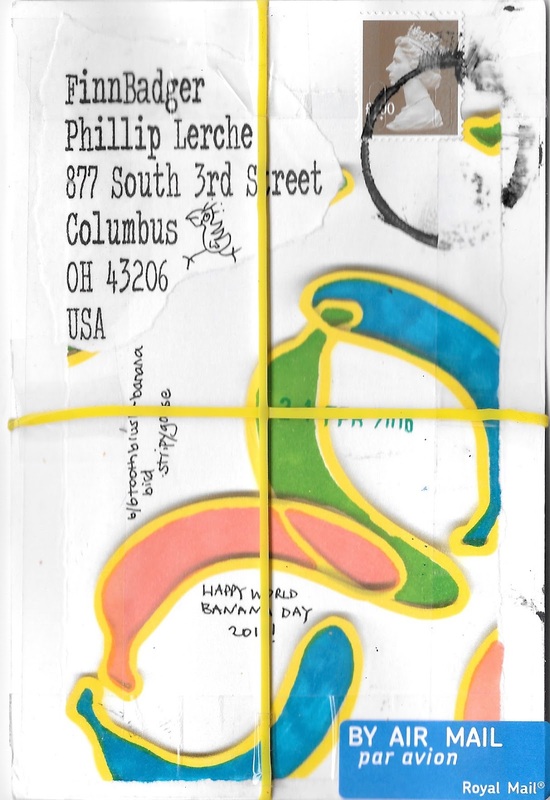 Great home made envelope and card from Rose. 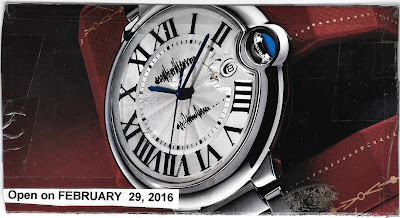 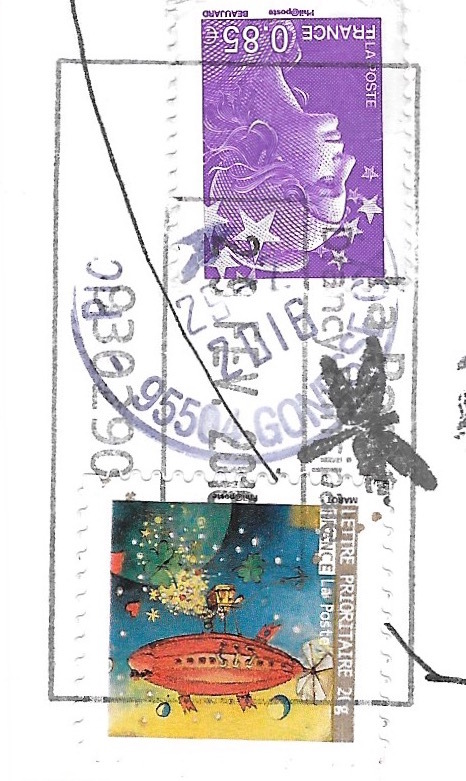 USPS finally released a new global stamp on Feb 22 - and it is a beauty, featuring the full moon. 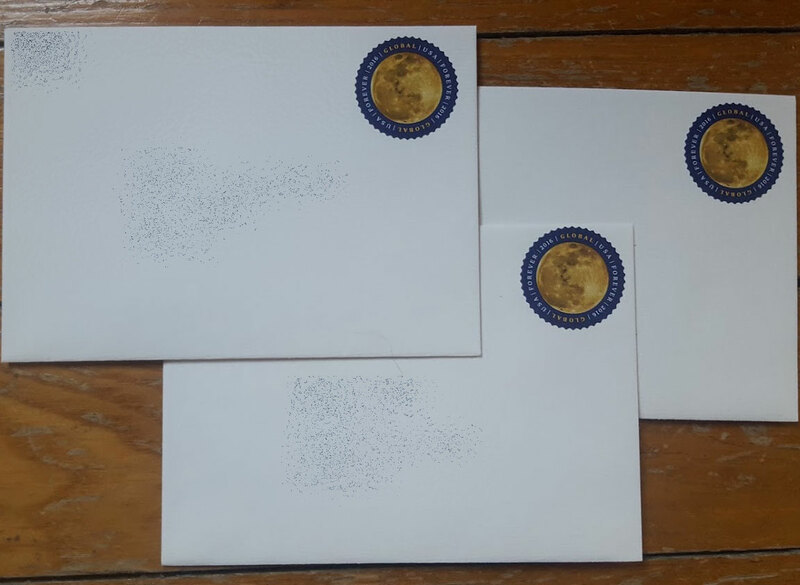 I have already sent out a few of them. 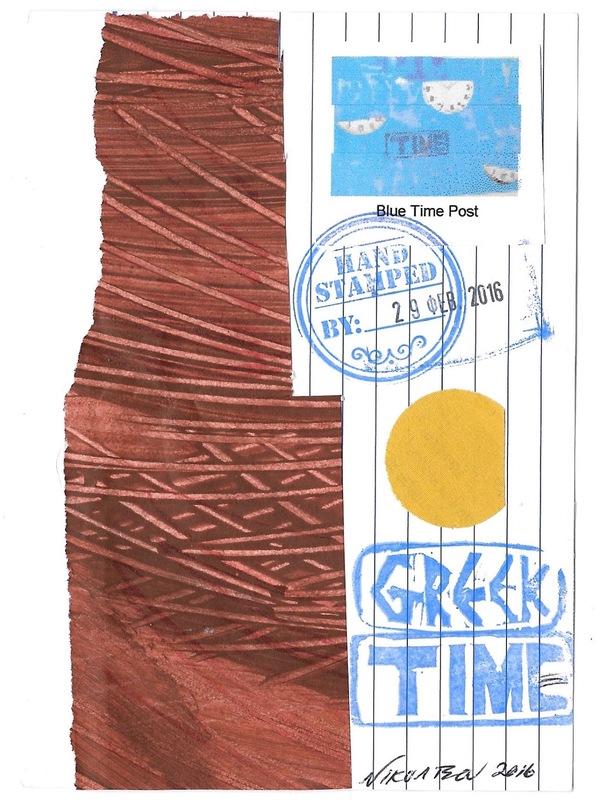 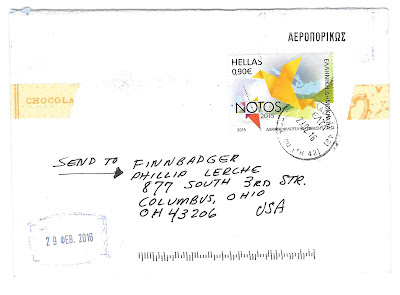 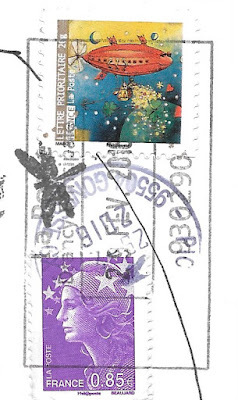 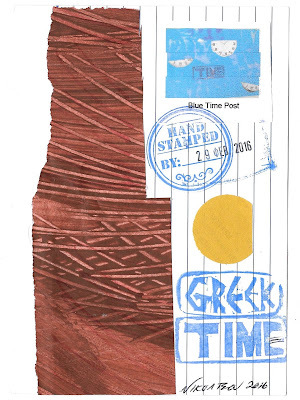 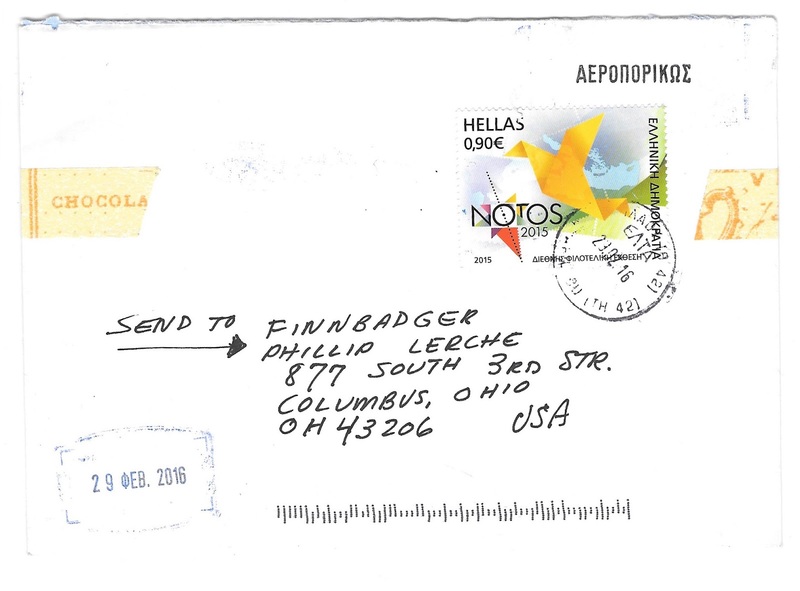 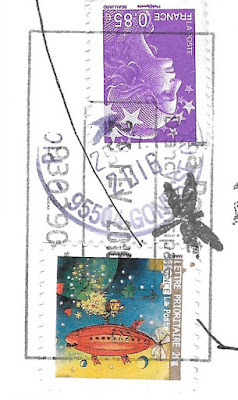 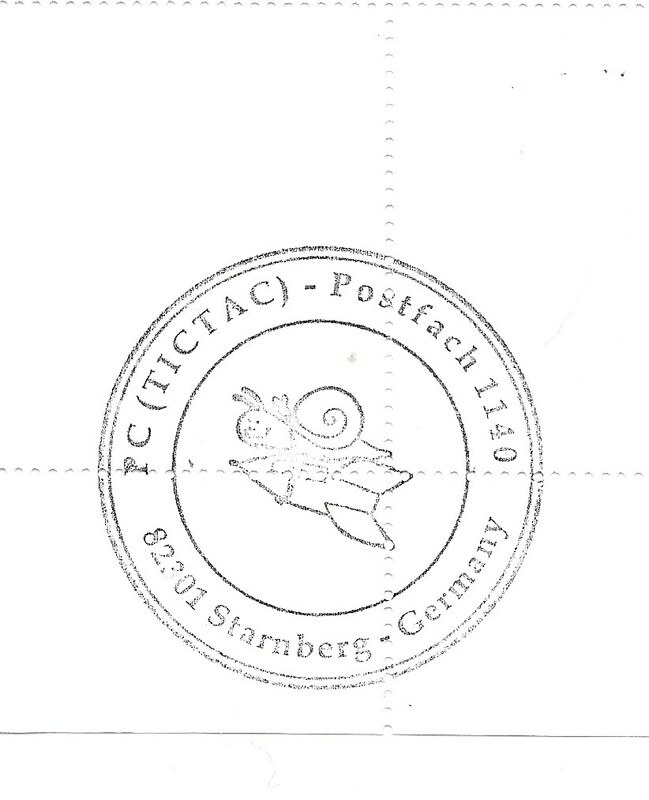 One of my favorites is this one to Katerina in Greece - Greek airmail envelopes used to have blue edges, but lately she has been unable to find them - aargh, the slow death of snail mail. Update!! 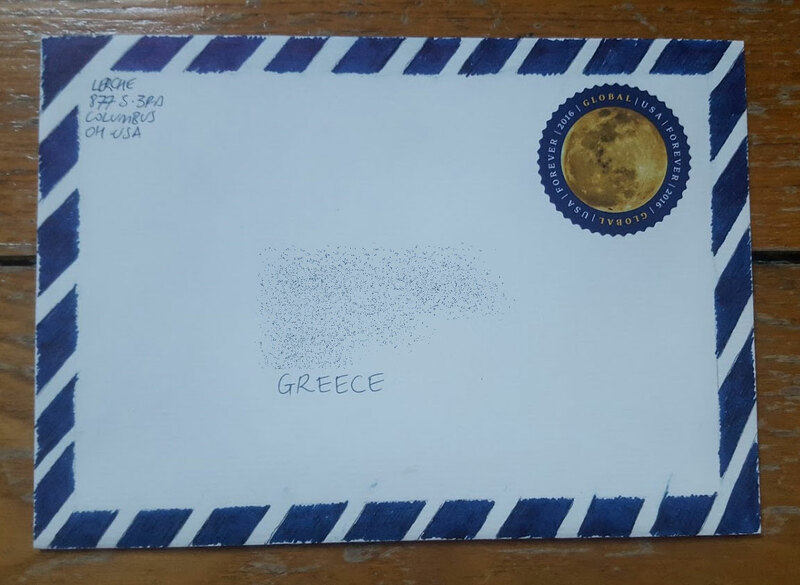 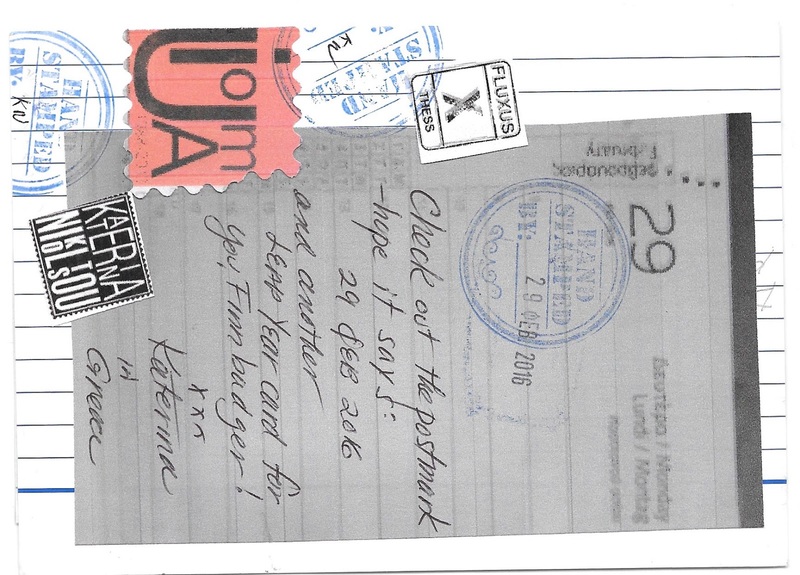 The same week that Katerina received my 'Greek airmail' envelope, she found a stash of envelopes in a small shop - so she'll be sending them out again. 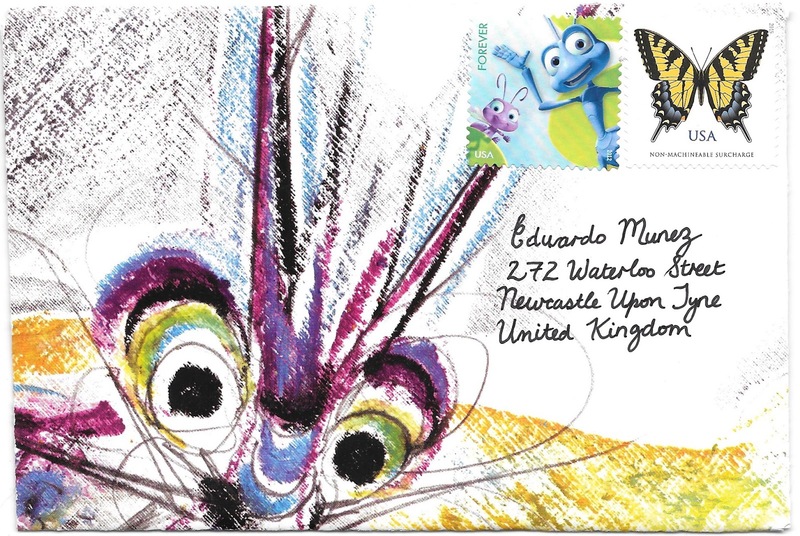 I also sent moons to Eduardo Munez, Bridget and Eva. 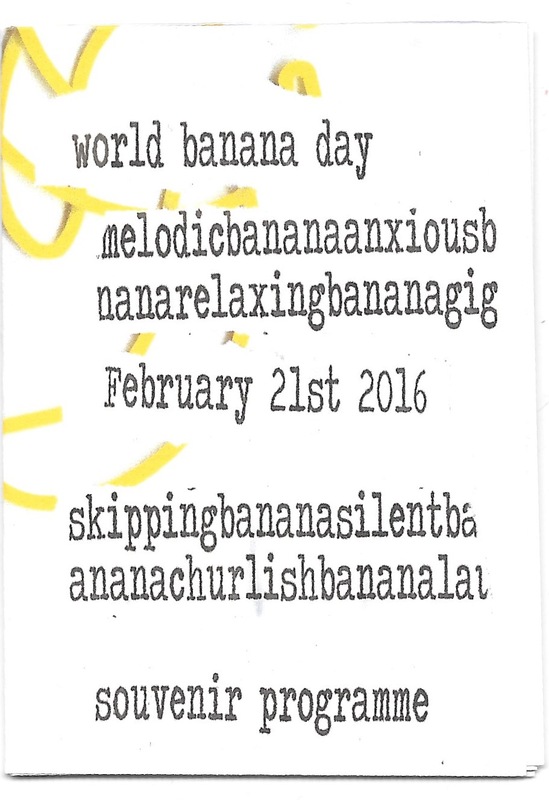 A month ago was banana day - here's what landed for the celebration! A joke and a giant banana artistamp... and its babies on the other side. 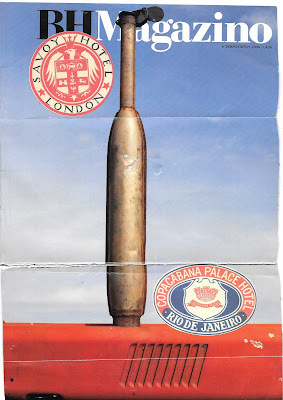 And a ruby red £1.00 - the current one is brown; I like this color better. 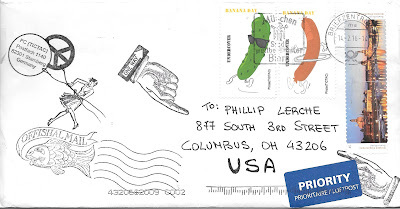 Thanks, Scott. 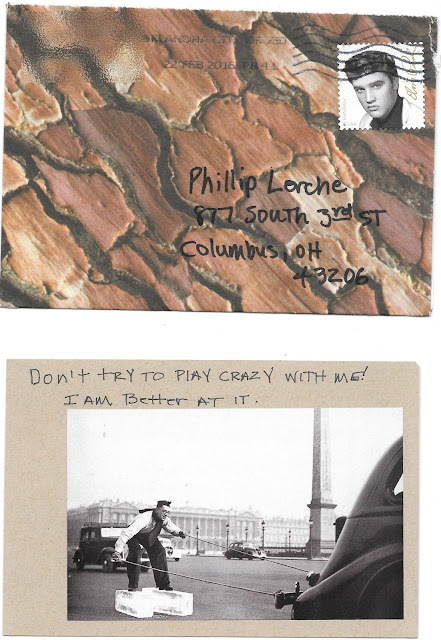 Thanks to Dean for this double-sided wonder. 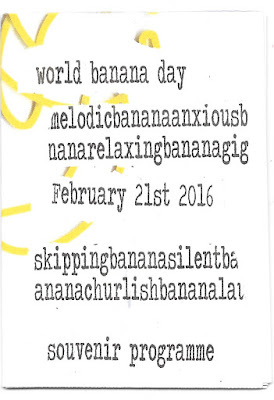 stripygoose sent this card, and when the bands are removed.... they are banana-shaped. TicTac (Ptrzia) sent these incredible faux stamps. Angie's banana card and another cool faux stamp. 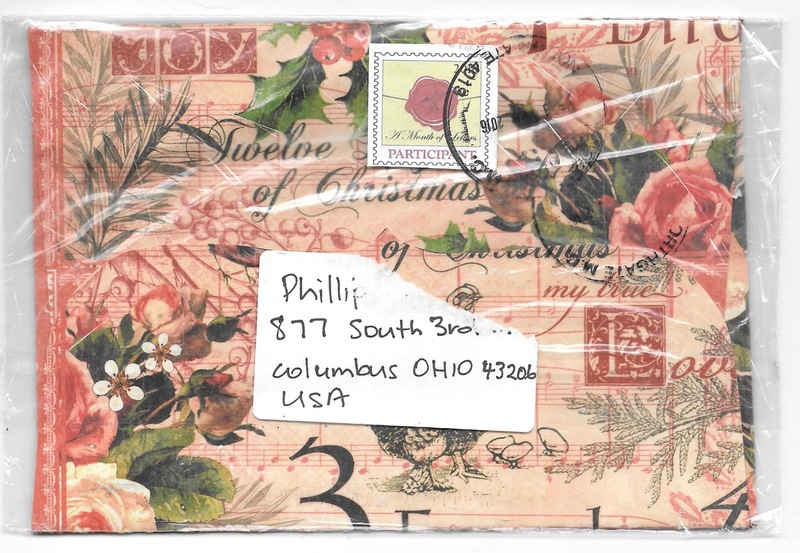 And a wonderful package from Carina. 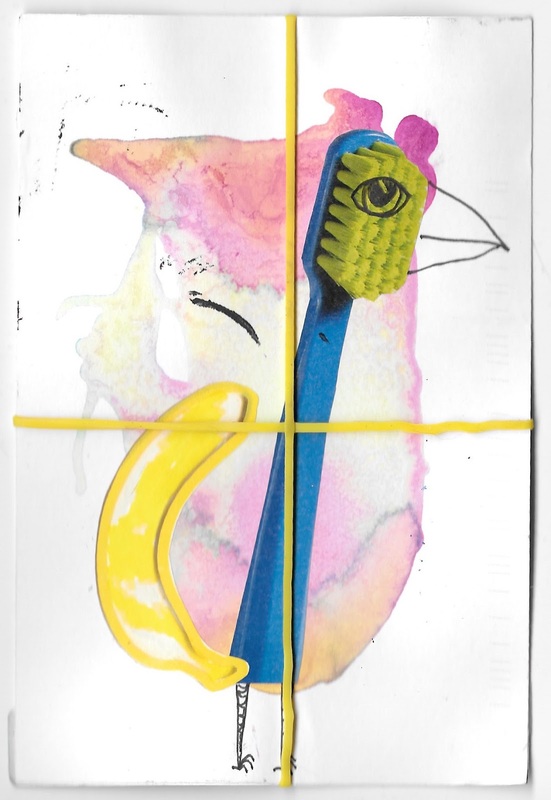 And then stripygoose sent an amazing minizine collection! 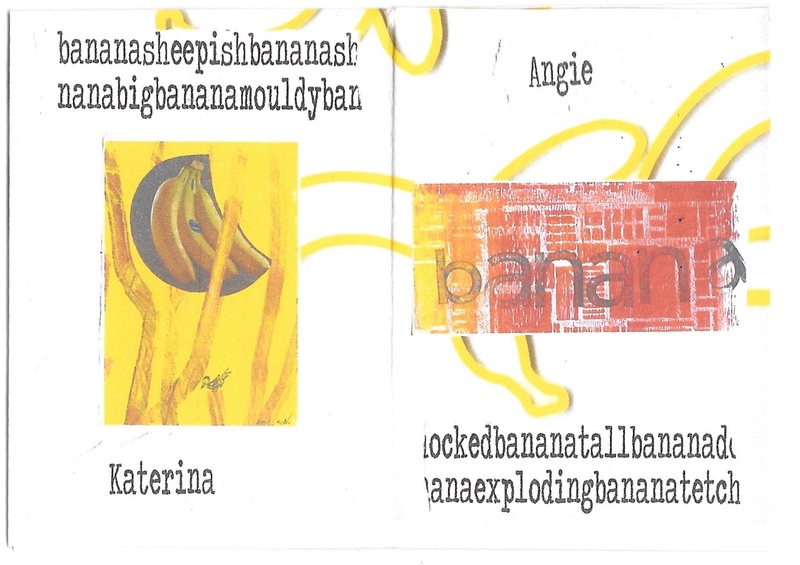 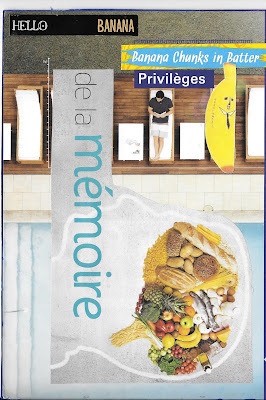 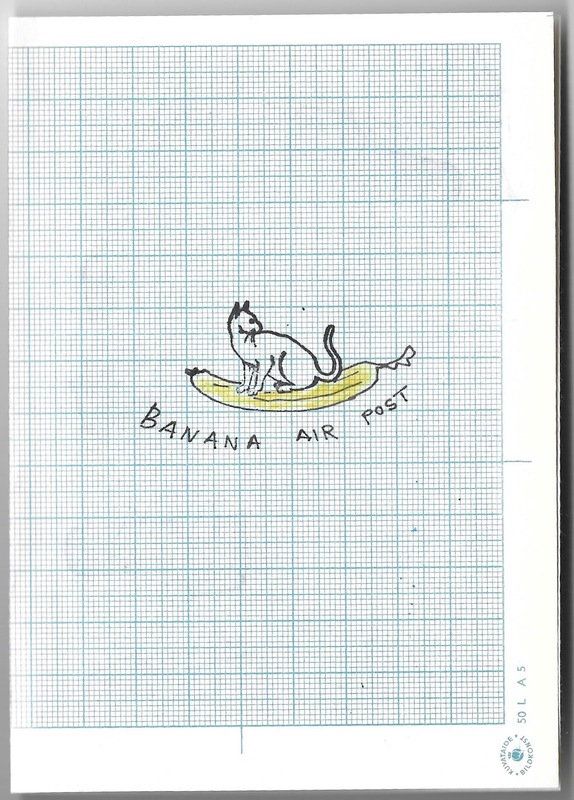 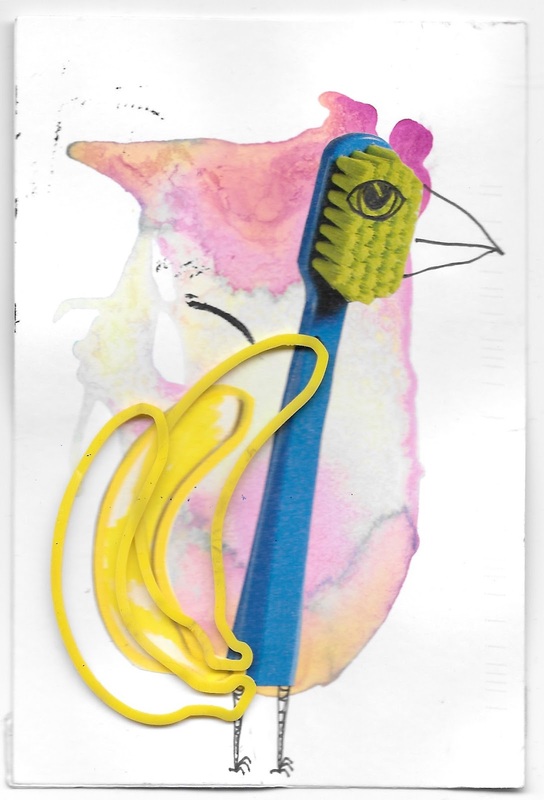 Katerina's banana moon went missing, so it is nice to see it in the zine.